(Indian Hemp (Apocynum cannabinum) - 01) This is a patch of Indian hemp that was growing along the side of the road. Indian hemp usually grow to heights of between one and four feet. 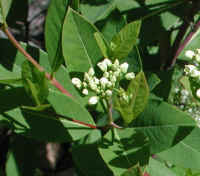 They look somewhat like a milkweed, and even have a white sap, but they are not a member of that family; they are members of the Dogbane family, Apocynaceae. (Indian Hemp (Apocynum cannabinum) - 02) This is a closer look at the Indian hemp. Their habitat is usually along the edges of open woods or in fields. They bloom from June to August. 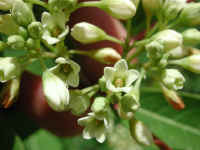 The Indian hemp in our area begin to bloom in early June. (Indian Hemp (Apocynum cannabinum) - 02a) Indian hemp have reddish colored stems that emerge from a spreading root. 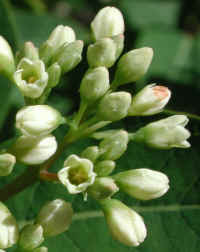 The upper portion of the wildflower is usually branched with terminal flower clusters on each stem and branch. 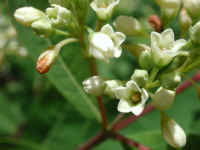 (Indian Hemp (Apocynum cannabinum) - 03) Indian hemp flowers are white or greenish white, have separate stems, and grow either erect of somewhat drooping. (Indian Hemp (Apocynum cannabinum) - 03a) In this close-up of the Indian hemp flowers, we can see that the flower stems do not have the reddish color of the main and branch stems. (Indian Hemp (Apocynum cannabinum) - 04) This is another look at the greenish white Indian hemp flowers. (Indian Hemp (Apocynum cannabinum) - 05) The leaves of the Indian hemp grow opposite one another on the stems. In this photo we can see a branch growing from a lower leaf axil. 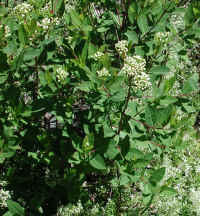 The fibrous stems were used by Native Americans to make twine and rope. The advantage of using these fibers is that they do not come apart in water. (Indian Hemp (Apocynum cannabinum) - 06) This is another photo of Indian hemp. (Indian Hemp (Apocynum cannabinum) - 07) This is another close up view of some of the Indian hemp flowers. (Indian Hemp (Apocynum cannabinum) - 07a) The actual size of the Indian hemp flower is 1/4 inch wide. The five petals curl slightly inward. 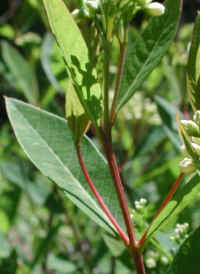 The pistil of the Indian hemp has no style (stem-like portion), but only a stigma which is shared by two ovaries. 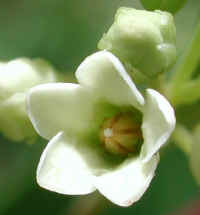 The five triangular shaped structures that form a "cone" in the center of the flower are the anthers of the stamens. (Indian Hemp (Apocynum cannabinum) - 08) In this bee's eye view of a 1/4 inch Indian hemp flower, we have a good look at the stigma sitting on top of the two partially obscured ovaries. 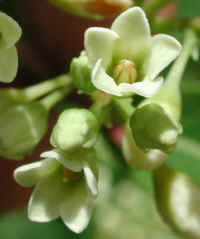 (Indian Hemp (Apocynum cannabinum) - 09) In this close up photo of Indian hemp flowers, we can see several stages of development: from bud, to opening flower, to mature flower, to drying flower in the process of developing a small bean-like fruit.